Talking Walking Dead: He's Baaaaaack! So, It would appear from the teaser for next episode that Big Bad Merle Dixon is back FINALLY and I for one am looking very forward to seeing Daryls wild man of a Big Brother returning. I think He'll show Shane a thing or too about cold hearted cruelty. Feel free to comment if you will Peeps. 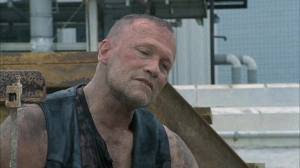 I am very interested in seeing the return of Merle, can't wait to see what happens!